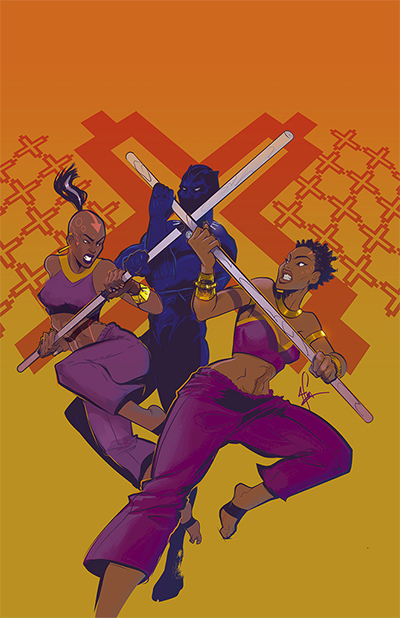 Afua Richardson is an American illustrator best known for her work on the Eisner winning series Black Panther: World of Wakanda. Her works influenced the CG team in the making of the film. Other works include the reader's choice award mini-series Genius, written by Marc Bernardin and Adam Freeman and the American Anthology for Attack on Titan for Kodansha. Afua has done various cover work on Xmen 92, Captain Marvel, Captain America and The Mighty Avengers for Marvel Comics, All-Star Batman, Wildstorm for DC comics and Mad Max. She is the artist on the sequel to John Lewis and Andrew Aydin's Civil rights graphic novel RUN published through Abrams Books.